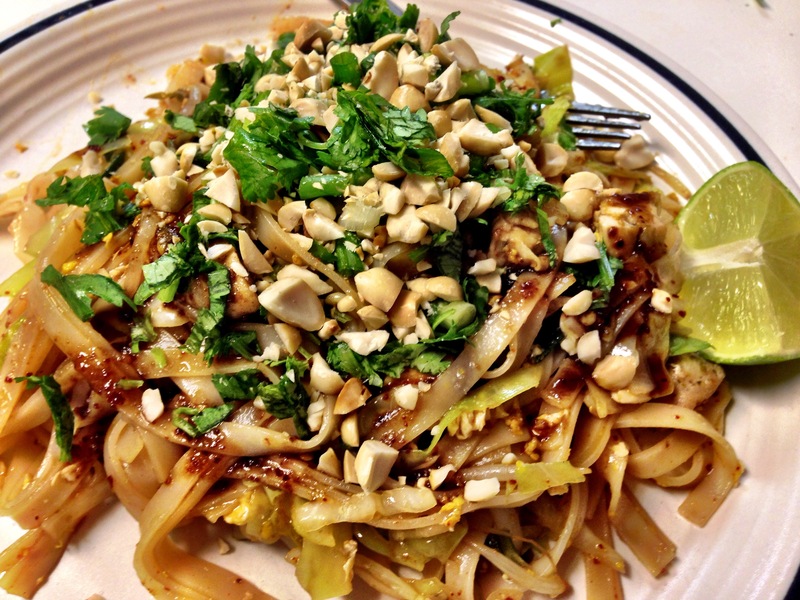 Pad Thai – One Half Indian. It’s been a busy few weeks. My husband has been traveling and studying as he looks for his next work venture and my in-laws seem to have more and more work obligations as well. Basically, the extra work makes for not much cooking and even less writing. But even with the busy schedules, my husband and I did make some time for the Raleigh Craft Beef Festival. It was rainy, but that didn’t stop us! As for me, I am counting down the days until summer and simultaneously wanting a few extra days with my students before they take their state tests (can we all just agree that state testing for school subjects is the worst. thing. ever.). This Pad Thai really hit the spot for our busy-week-day blues. Thai food at home always seems like an impossibility to me. I feel like I don’t have the right cupboard ingredients for it and the produce cannot be found at my grocery store. That may be true for some Thai recipes, but not all. 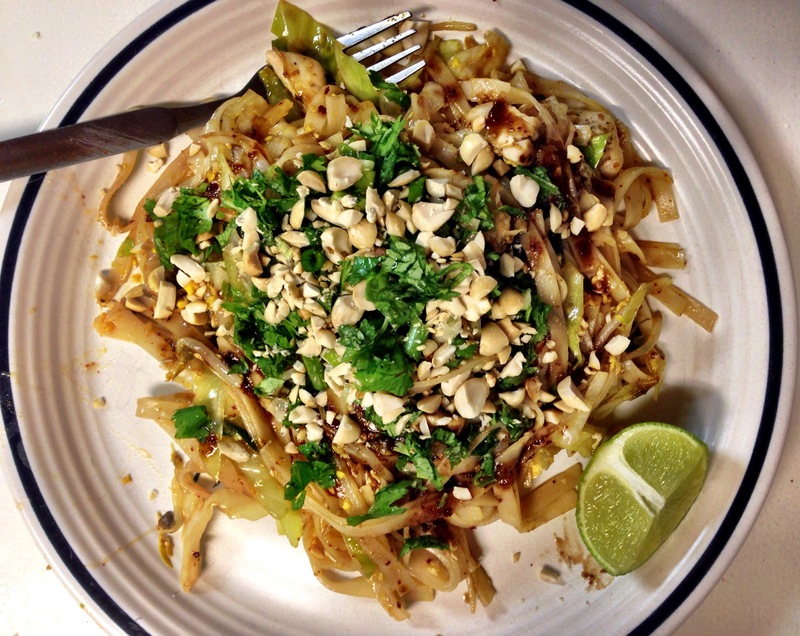 I thought this Pad Thai was pretty accessible and easy, and the ingredients are definitely easy to find at a normal grocery store. Also, I used soy sauce in stead of fish sauce. I know, it seems wrong. It is just so stinky to me. I only recently began to eat fish and I just hate the smell, so fish sauce is a mild form of torture for me. I enjoy it in my food when I don’t have to personally open the bottle and add it. I am American and weak when it comes to this fermented bottle of stank. Depending on what you have on hand or already made, this dish can go pretty fast. We already had some tamarind based chutney and leftover chicken which we threw in the dish and cut the cook time way down. This recipe was adapted from Mark Britton on the NYTimes Cooking Blog. 1. Put noodles in a large bowl and add boiling water. Let noodles sit until they are soft and tender; about 10 mins. Check noodles every 5 minutes ish to be sure they do not become too soft. Drain the noodles and toss with a tbsp of peanut oil to keep them from sticky. 2. While the noodles are soaking, make the sauce. In a small sauce pan over medium heat, combine rice wine vinegar, soy or fish sauce, tamarind paste, honey, and jaggery. Heat the sauce to a simmer, add red pepper flakes, and remove from heat. 3. In a large frying pan, heat 3 tbsp of peanut oil, When oil is hot, add scallions and garlic. Let the garlic and scallions cook for about a minute and then add the eggs to the pan. Let the eggs cook until they are just beginning to set and then scramble them into tiny pieces. 4. Add cabbage and salt. Cook the cabbage until it begins to wilt. 5. Add cooked chicken or tofu to the pan. Toss to combine. 6. Add the noodles, bean sprouts, and sauce to the pan. Toss all ingredients together so that sauce coats every noodle. Heat until noodles are hot. Serve with peanuts and cilantro on top and a lime wedge on the side.